The end of another MARVEL UK era: THE SAVAGE SWORD OF CONAN THE BARBARIAN issue 84 (October 1984) announces the impending merger of THE MIGHTY WORLD OF MARVEL. Although MWOM's second volume only clocked-up seventeen issues, it's line could be tracked (with a couple of brief hiatuses along the way) all the way back to the launch of the original MWOM, the British Bullpen's first title, in 1972. The Marvel Revolution transformed MWOM weekly into the new MARVEL COMIC in January 1979 (February's copies were lost in a distribution strike which forced Marvel to briefly shut up shop) only to see another relaunch, as the monthly MARVEL SUPERHEROES, that summer. MARVEL SUPERHEROES clocked-up 397 issues (retaining the original numbering dating back to 1972) before expiring in May 1983, giving way for the revived MWOM. Folding MWOM into SAVAGE SWORD wasn't an obvious combination (indeed, it seems to have been design to annoy readers of both) but it's a sign of how few options Marvel had left. For the first time since the launch of RAMPAGE's second volume, Marvel UK had no monthly superhero book. The British Bullpen had at least been canny enough to cue up a fantasy strip (a reprint of the X-Men spin-off MAGIK, another four-issue limited series) in MWOM's final outing rather than try and shoehorn in a pure tights-and-flights story. Despite (or perhaps because of) the combination, Conan's own time was coming to an end and Savage Sword itself shuttered with a hefty extra-length 93rd issue within a year. Savage Sword 85 was also the first issue of the Conan monthly to boast colour interior pages. 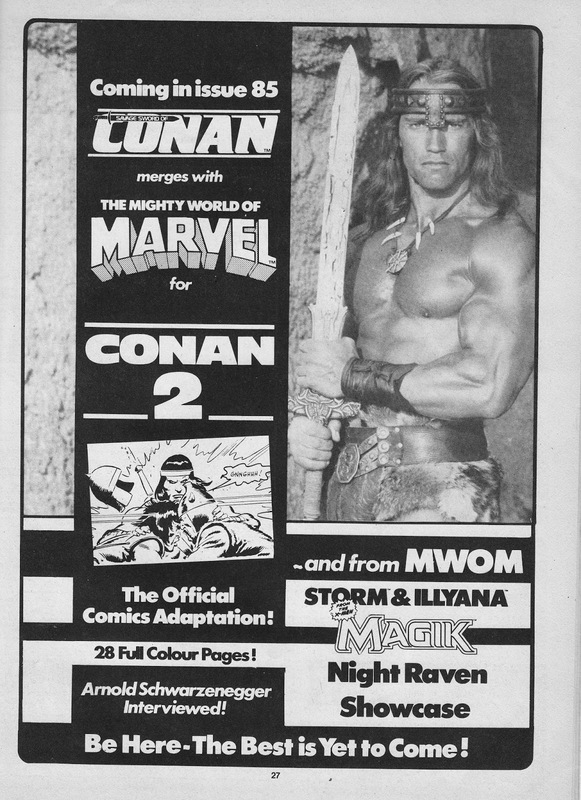 Marvel UK also issued the CONAN THE DESTROYER movie adaptation as an annual.